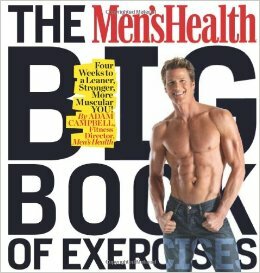 Among the resources in my PT library is “The Men’s Health Big Book of Exercises.” I’m here to tell you why I like it and why you should consider picking up your own copy. The lion’s share of this book is the exercises – 619 of them, in fact. Of the book’s 15 chapters, nine of them pertain to the exercises themselves, with a separate chapter for various body parts – chest (chapter 4), back (chapter 5), shoulders (chapter 6), etc. Each of these chapters begins with a just-technical-enough description of the muscles involved and corresponding pictures. The well-illustrated exercises follow with key points on proper form highlighted. The book also includes chapters that discuss the importance of resistance training, answer common questions about training (e.g. how many reps should I do? what weights should I select? ), offer diet and exercise plans, and discuss nutrition. My favorite thing about this book are the exercises themselves. Even with all the resources available online, it’s nice to have a physical book to pick up and leaf through. I often find myself turning to this book when looking for inspiration for new exercises for my clients, and the illustrations are top notch. I also think the author strikes the right balance between technicality and simplicity, making it a good resource for BOTH trainers and a more lay audience. For instance, the rank and file may really appreciate the anatomy material, while more informed readers can probably skip this over. At the same time, there’s other more detailed material that lay readers may skip over but fitness professionals may really appreciate. The nutrition chapter has a section entitled, “The Simplest Diet Ever,” which I largely endorse. Many people struggle with how to eat for fat loss, largely because there’s so much information out there, a lot of which is conflicting. When working with clients who hope to trim down, I emphasize what I consider the key points, many of which the author outlines in this chapter: eat a lot of fruits, vegetables, and lean protein; eat healthy fats in moderation; reduce your intake of starch and sugars; watch your total caloric consumption. Certainly the EXECUTION of these principles may still prove daunting, but at least the reader knows where to begin. Overall, I think this book is great, but there is one change I’d like to see. Many of the 619 exercises in the book are variations on a more basic move. The barbell squat, for instance, has ten variations, including wide-stance, front-loaded, and quarter squat. My issue is that often the author fails to explain WHY someone might want to select one variation over another: are different muscles recruited? does one variation put less stress on certain joints and is therefore better for certain populations? Is it just about variety? Here’s a close-up, in case you’re having trouble following me here. All-in-all, this is a great book! I picked up a cheap used copy online. And even if you dislike the content, it’s hard to argue with the eye candy.